The old gas station at the northeast corner of San Benito and South Streets was built around 1936. 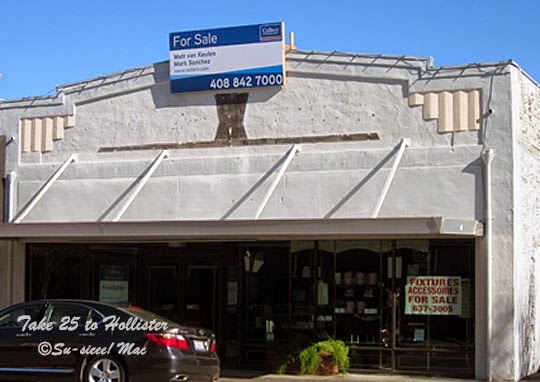 It is another contributing building to the Downtown Hollister Historic District, which means it cannot be demolished without first meeting certain measures. The National Register of Historic Places cites the one-story building as having a typical design of gas stations of the 1930s. The windowed office is on the right, while two auto service bays are on the left. Still standing is the flat-roofed carport that once protected gas pumps. I remember this was an ARCO station in the 1970s. 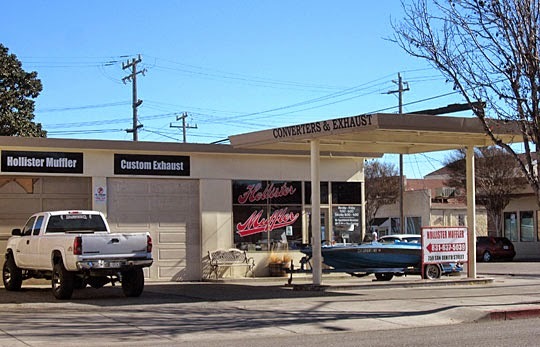 Today, Hollister Mufflers makes its home there. 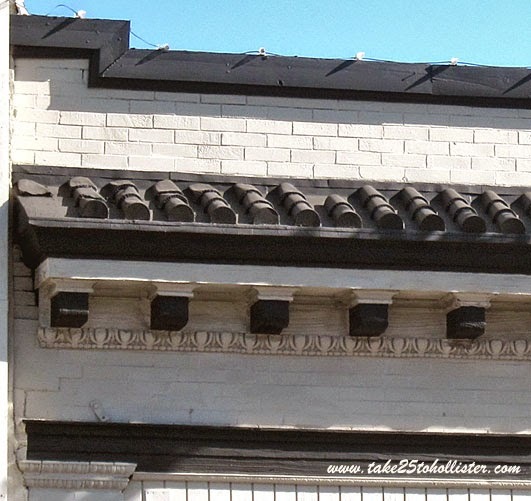 Recognize the decorative cornice and those interesting urn-looking things on this building? 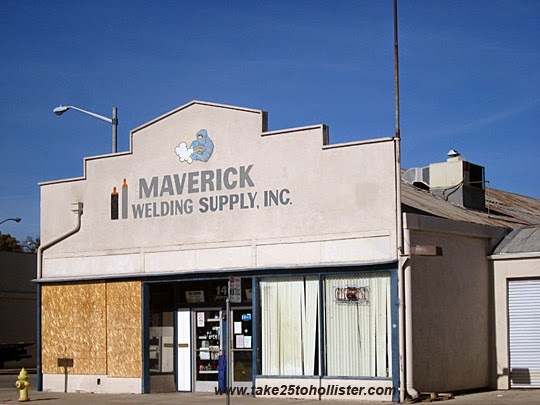 Where do think this commercial building is on the main street in Hollister? It's the two-story commercial edifice at 625 San Benito Street, next to the Veterans Memorial Building. The DeLux Salon is on the ground floor. Surprised? 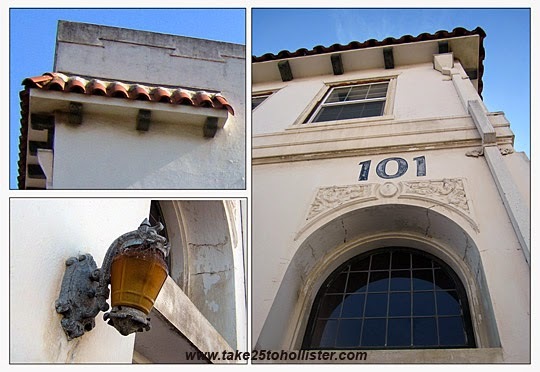 It was constructed around 1908 and is one of the contributing buildings to the Downtown Hollister Historic District. From the front, it looks like a small building. But, just peek around the corner, and you'll see that it is a relatively good-size building. The next time you go by 625 San Benito Street, check out its two bay windows. One is above the salon, while the other is on the side of the building. 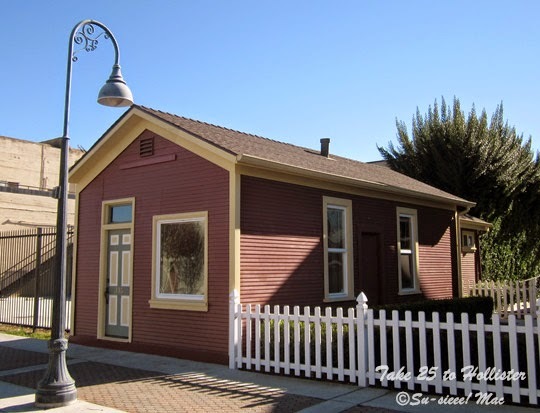 This cute little brown house is another contributing historic building to the Downtown Hollister Historic District. Located at 335 Sixth Street, just behind the Grangers Union Building, the one-bedroom, one-bath house was built around 1923. It was originally an office building. 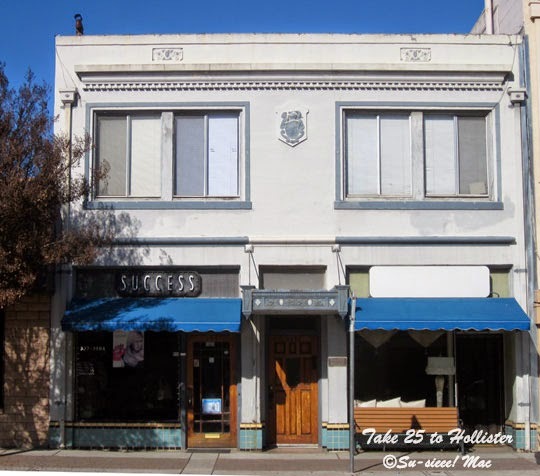 The commercial building for sale at 549 San Benito Street is another contributing historic building in the Downtown Hollister Historic District. The reinforced concrete edifice was built around 1940, according to the National Register of Historic Places. It's a one-story building with a mezzanine. 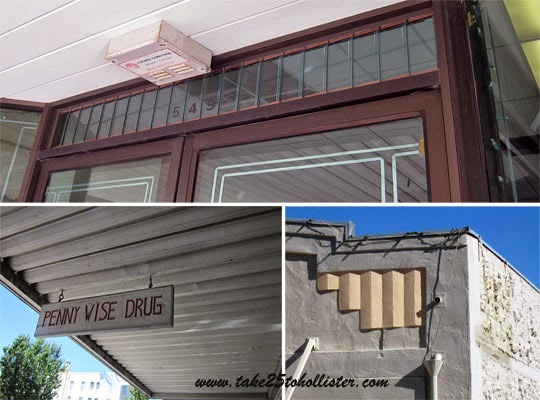 Some of the neat features of this building is the decorative molding on the top of the building, the transom above the front door, and the flat, wooden awning. It's been over a year since Penny Wise Drug closed its doors. Whose else misses Joan, Jeannie, and Stephen? The drugstore was at 549 San Benito Street for many years. I don't recall when they moved there, but during the 1950s and 60s, Rasco, a five-and-dime store, occupied the space. Anyone else remember the instant aroma of freshly popped popcorn as you walked into Rasco, whether through the front or back door? The Veterans Memorial Building, at 649 San Benito Street, is a local landmark. 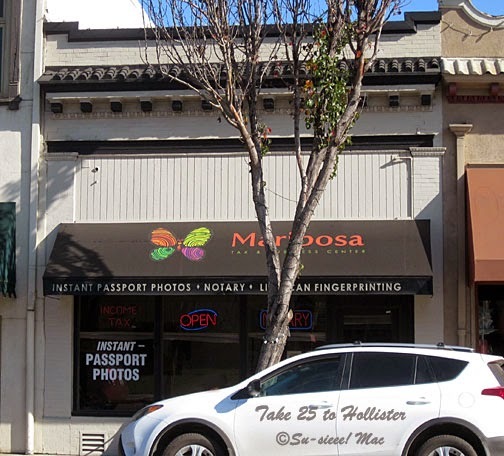 It is also another contributing building in the Downtown Hollister Historic District. This handsome two-story building was dedicated on November 11, 1927, nine years after the Armistice was signed between Germany and the Allies to end World War I. 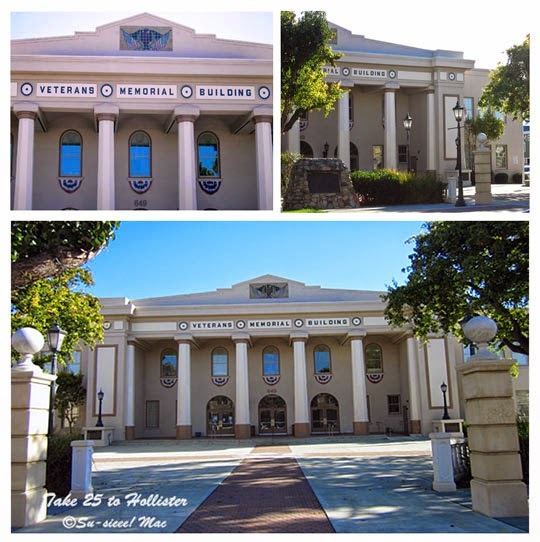 Over the years, the Veterans Memorial Building has been used for various governmental, community, and private events, from town hall meetings to public concerts and private weddings and birthday parties. Made of reinforced concrete, the Veterans Memorial Building is divided into three bays, with the center bay being twice the size of the side bays. The porch, or portico, of the center bay, is supported by two side piers and four eight-sided columns. Several gorgeous rounded windows and three arched entrances are protected by the portico's roof. Jane McClosky Wapple was the person behind getting the building constructed. In 1923, she proposed the idea of establishing a building to honor the military members of San Benito County who died in World War I. To raise construction funds, Mrs. Wapple and her friends held a horse show at Bolado Park, which brought in $14,000. By the way, that horse show, which she called the Spanish Fiesta, became the start of the annual San Benito County Saddle Horse Show and Parade. Mrs. Wapple was a very interesting person in Hollister history. If you'd like to learn a little more about her, check out this article, "Sweet Jane Wapple," written by Martin Cheek in the Gilroy Dispatch. Today is Our World Tuesday. Click here to check out what's going on in other parts of the world. The Downtown Hollister Historic District series continues today with a look at the Kearney Building on Fifth Street. This two-story commercial structure is another contributing building in the historic district, which means that it cannot be demolished unless it meets certain measures. 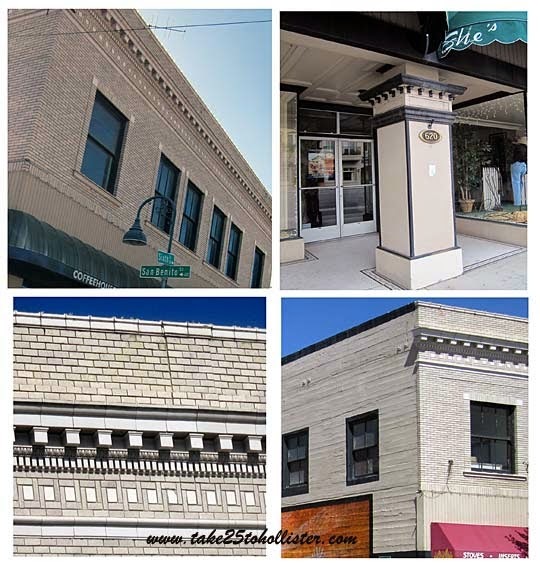 The Kearney Building was constructed around 1929 and still has many of its original decorative features intact, including the beautiful banded tile at the bottom of the building. Between the windows is a plaque that looks like a crest. Could it be Kearney's crest? This is one of the few buildings in town that actually has a plaque of its name on it, which is next to the central doorway. Every time I pass by it, I wonder who Kearney was. Anyone know? Today is Blue Monday, hosted by Smiling Sally, and that's where I shall be. Come join me by clicking here. Today, the two-story commercial building at the southeast corner of San Benito and Fourth Street is a church. Originally, the building at 401 San Benito Street was a grocery store. It was built in 1907 to replace the first building destroyed in the 1906 Earthquake. 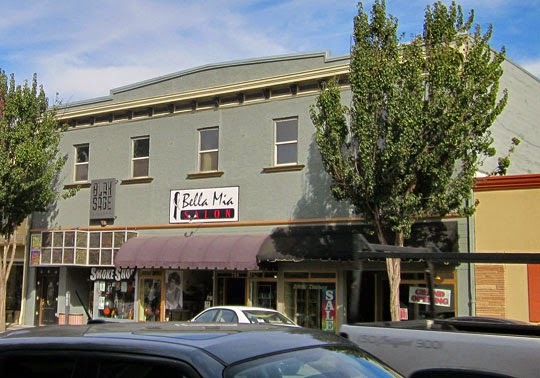 It is a contributing building to the Downtown Hollister Historic District, which means that the owners cannot demolish it until certain measures are met. The storefront was remodeled for a modern look in the 1970s. 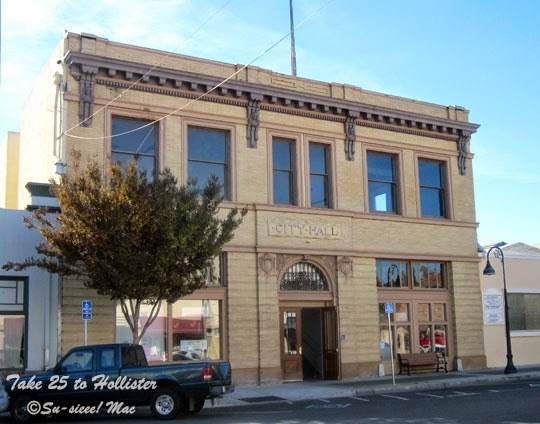 This historic building is one-of-a-kind in Downtown Hollister. It has two square corners, which remind me of castles. The fancy parapet at top of the roof has a cheerful curved middle section, which makes me think of the Three Musketeers. And, the balcony on the second floor, well, that brings Romeo and Juliet to mind. By the way, that balcony is a copy of the original one that had gone missing at one point in time. The copy was made from original timbers, according to Welcome to Historic Downtown Hollister, a walking tour pamphlet by Sharlene Van Rooy. I'm hooking up at Sundays in My City, hosted by the Unknown Mami. Come check out posts of other cities around the world by clicking here. 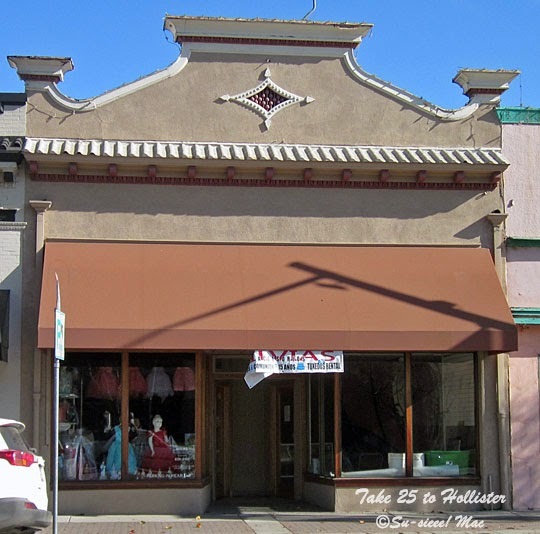 The one-story commercial building at 417 San Benito Street is another example of 1880 architecture in the Downtown Hollister Historic District. The storefront, though, may have been remodeled after the 1906 Earthquake. Today, it's home to Silvia's Jewelry and Gifts. 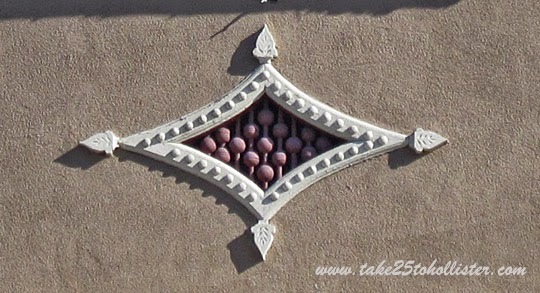 Ever noticed this decorative detail near the top of the building? Beautiful, isn't it? It's described as a diamond-shaped false vent. The beads, I'm guessing, are to simulate vent grilles. The vent makes me think of Tales from the Arabian Nights. Actually the whole top of the building makes me think of The Tales of One Thousand and One Nights. I like the way the parapet slopes downs from its center on either side and then slightly travels back up. I also like that sloping cornice with a fluted look and that fancy dentil below it. I wonder what the building looked like before the storefront was remodeled. The two-story commercial building that takes up half the block on the west side of San Benito Street between Sixth Street and Brown Alley is called the Grangers Union Building. 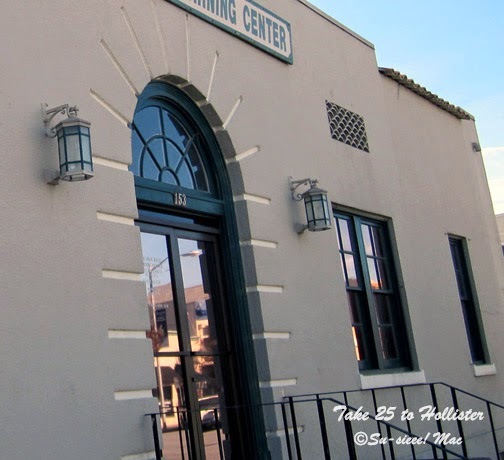 This historic contributing building in the Downtown Hollister Historic District was built in 1917. A general merchandise store incorporated in 1890, the Grangers Union had two previous buildings at the site. The 1906 Earthquake destroyed the first building, while a fire took the second building. 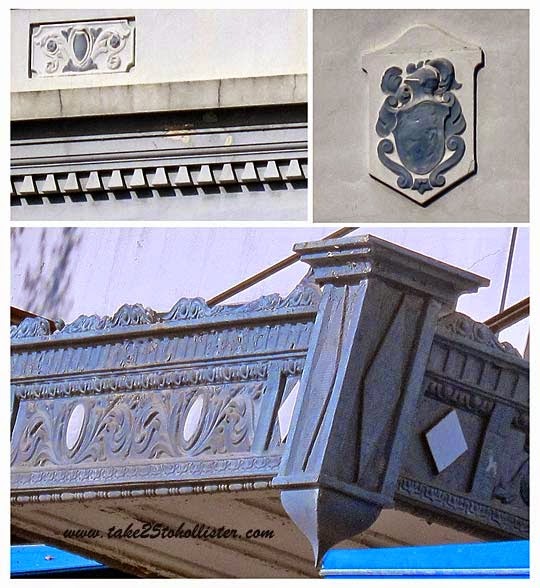 Glance up at the top of the building to see the beautiful detail of the cornice that goes around its front and side. The entry way to She's, which used to be Ladd's Hardware, is my favorite aspect about the building. As a kid, I always thought the support column was a sign of times past and when I went through the doorway, I felt like I was stepping into another world. I still do. Aren't the details of this building amazing? The building was constructed in 1907, after the original one on the site was destroyed by the 1906 Earthquake. In the 1960s, either this storefront or the one to its right had a display of Buster Brown shoes. I always wanted a pair. 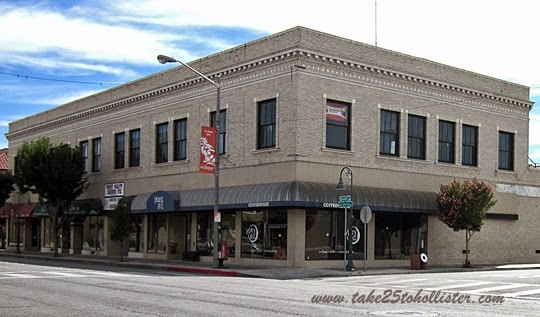 The commercial building at 419 San Benito Street is one of the oldest contributing structures in the the Downtown Hollister Historic District. The single-story structure was built around 1880. 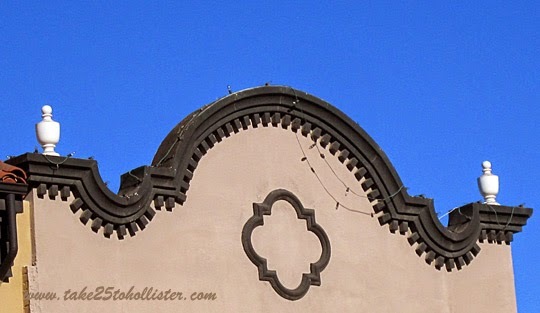 The National Register of Historic Places notes that the parapet (the green protective wall along the roof's edge) may have been remodeled after the 1906 earthquake. It also notes that the storefront, with several windows in different shapes, was changed in the mid-1970s. 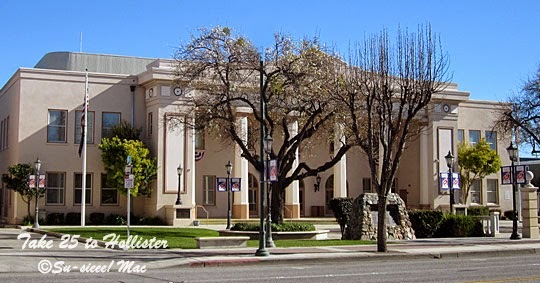 On the south side of Fifth Street, between San Benito and Monterey Streets, are the old and current City Hall buildings, which are both contributing historic structures in the Downtown Hollister Historic District. 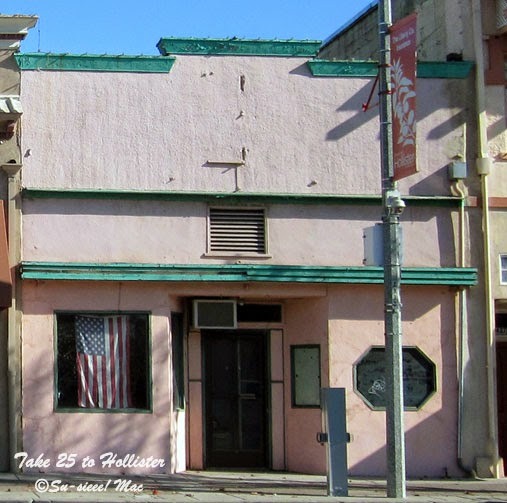 The Hollister City Hall was originally located at 339 Fifth Street. The first building was destroyed in the 1906 Earthquake. Two years later, the new beautiful two-story City Hall, designed by William H. Weeks, was completed. The west side of the building housed the Hollister Fire Department. The building has many interesting decorative features. Click here to see a close-up of one of the figurines—brackets—at the top of the building. 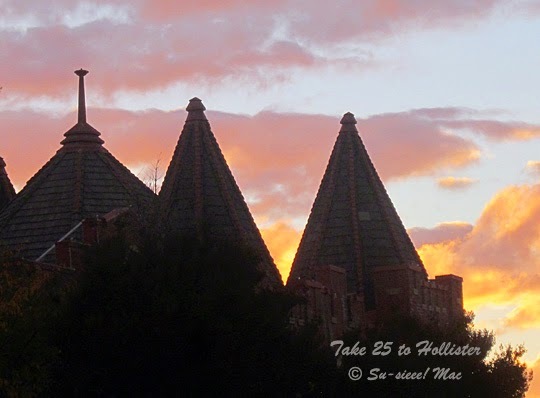 Once upon a time, the Old City Hall had a cupola. Click here to see vintage postcards of how the building looked over 100 years ago. Today, the City of Hollister uses the first floor of this building for its utility payment center and offices for its building and planning divisions. Some of you may recognize the Classical Revival style of the current City Hall as being a design of many Carnegie Libraries. You're right. The current City Hall was once the city library. 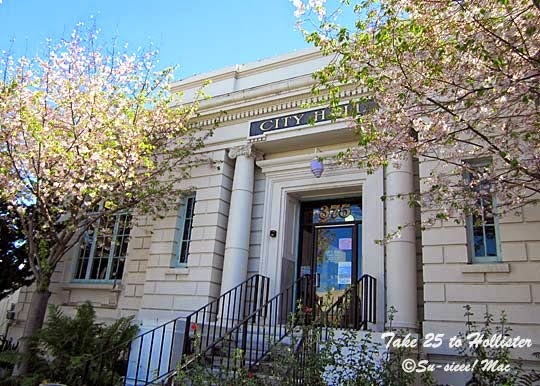 In 1910, the City of Hollister received a grant from the Andrew Carnegie Library Foundation to build the one-story reinforced concrete building. Completed in 1912, the building was designed by William Binder and constructed by E. J. Sparling. In the 1980s, the City built an addition at the rear for the City Council chambers. There are so many wonderful elements to this building, such as the Ionic columns that flank the entry way and the fine details of the cornice across the top of the building. What impresses me the most is that the concrete was scored to look like granite blocks. 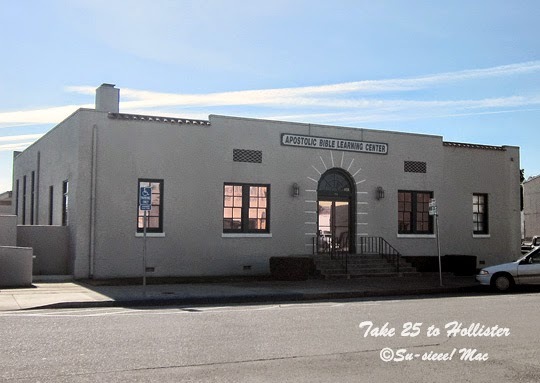 The Hollister Carnegie Library is entered in the National Register of Historic Places as part of the Downtown Hollister Historic District as well as individually. Want to see what the library looked like back in the day? Then, click here. Today is Our World Tuesday, and that's where I am linking up. Click here to check out what's going on in other parts of the world. Who remembers the old post office on 5th Street? And, the beautiful cedar tree next to it? The building is still there. It's now the Apostolic Assembly Bible Learning Center. What's missing though is the cedar tree. The old post office at 135 5th Street is the major contributing historic building on the eastern edge of the Downtown Hollister Historic District. 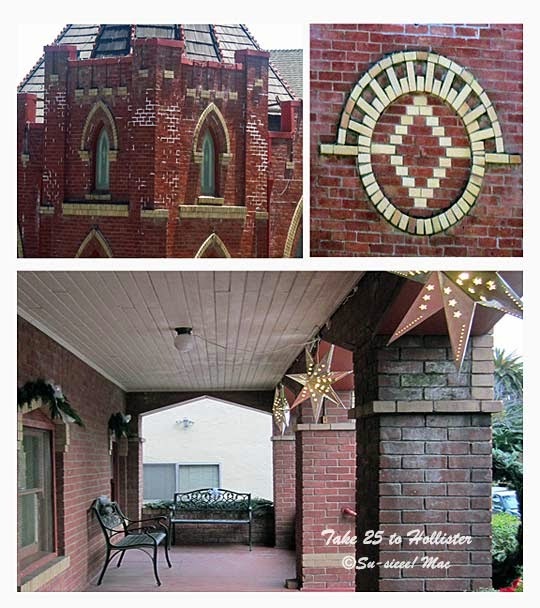 Built in 1935, the building was designed in the style of Spanish Colonial Revival. One of the interesting features of the building is the arched entrance surrounded by fake voussoirs -- those ray-like lines. Actual voussoirs are wedges of stone or other material forming the units of the arch. I am definitely learning a lot of architectural stuff with this series. Do any of you remember the awesome wooden mural that once hung in the old post office? It's now hanging at the new post office on Maple street. Click here for a photo of the mural. 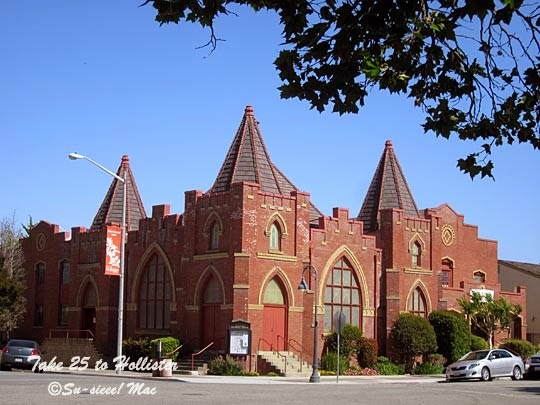 The red brick Hollister United Methodist Church is another contributing historic building to the Downtown Hollister Historic District, standing at the district's western perimeter. The National Register of Historic Places registration form lists the building as being built around 1880. The brick church was actually built in 1910. It was the second building for the then Methodist Episcopal Church (South). The original church was a wooden structure built in 1872. The original sanctuary is used today as the congregation's social hall. The architecture style of the two-story church is Late Gothic Revival. Everything about the church's facade is picturesque and romantic, from its pointed spires and square towers to its rounded roof, inviting porch, and multi-paneled windows with pointed arches. In 2012, the Hollister United Methodist Church celebrated its 150 anniversary. To read a bit about its history, click here. If you'd like to see photos of the church's beautiful stained glass windows, click here. 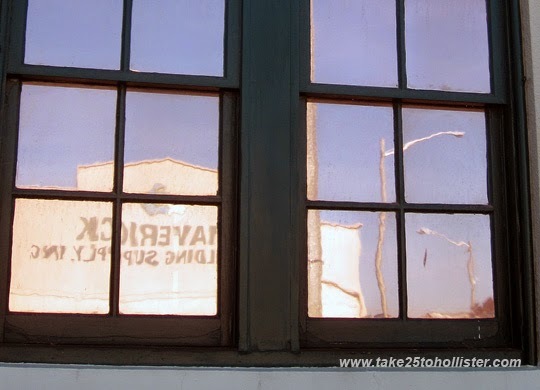 Reflected in this window is one of the oldest commercial buildings in the Downtown Hollister Historic District. Built around 1880, the single-story building at 140 5th Street looks like quite small and compact. Go around the corner to East Street and you can see that it's nearly half a block long. I'm linking up with Weekend Reflections. To see reflections that other bloggers have caught with their cameras, please click here. 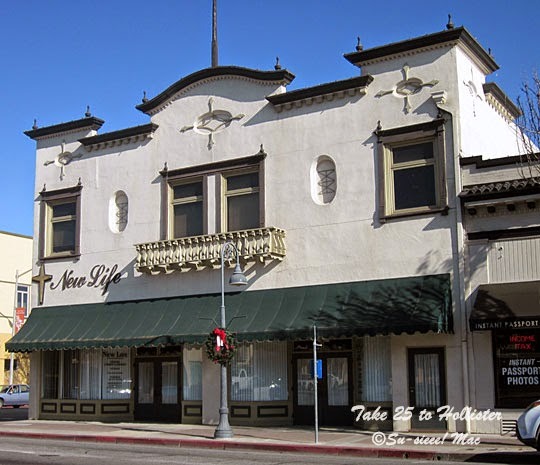 This two-story, reinforced concrete historic building in the Downtown Hollister Historic District was constructed around 1915. It is listed as 725 San Benito Street on the National Register of Historic Places registration form. The second floor shows its original face, while the first floor has been remodeled. The ceiling in Eclectic Treasures still has the original tin tiles. Click here to see how gorgeous they look. Better yet, head over to the store. The other two shops may have the original ceiling, too. 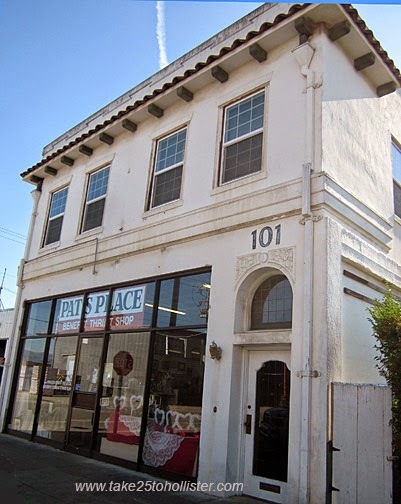 Today, most people in San Benito County know 101 Fifth Street as being the home of Pat's Place, a very cool thrift shop that raises money for the Community Food Bank of San Benito County. Originally, the historic two-story building was a laundry called the Model French Laundry. 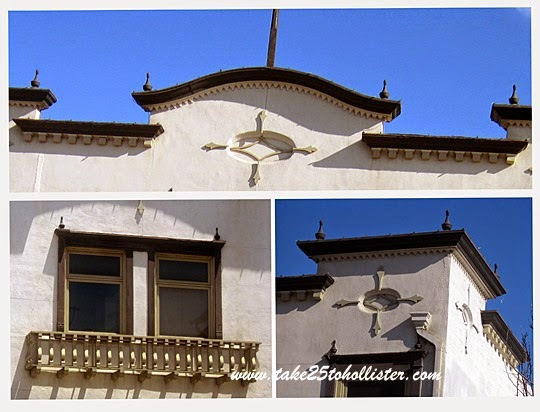 It was constructed around 1934 by Joseph and Marie Latapie, according to Welcome to Historic Downtown Hollister, a walking tour pamphlet by Sharlene Van Rooy. 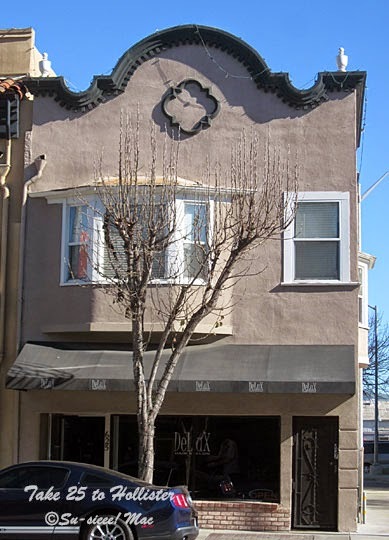 The Latapies moved from San Francisco to Hollister after the 1906 earthquake and operated their laundry in two other locations previously to settling at 101 Fifth Street. This is a contributing building to the Downtown Hollister Historic District. It was noted in the registration form submitted to the National Register of Historic Places for its parapet with a zig-zag band at the top to building and the tiled cornice with false vigas a foot or so below the parapet. The alluring arched doorway on the right side of the building was mentioned, too. I think the light fixture beside the doorway also gives the building its pizazz. The storefront, with its anodized aluminum door and windows, was remodeled in the 1980s. When I was a kid in the 1960s, I was fascinated with the Model French Laundry. The name always made made me think of the Eiffel Tower and I thought all French buildings had to look like this cute one. I never went into the laundry, but that did not stop me from imagining people inside speaking French and having a special way of making the clothes they laundered look chic and ooh-la-la.